These modern self-catering holiday homes in Clare are set around an Iron Age Stone fort with a breathtaking views over the Atlantic Ocean. 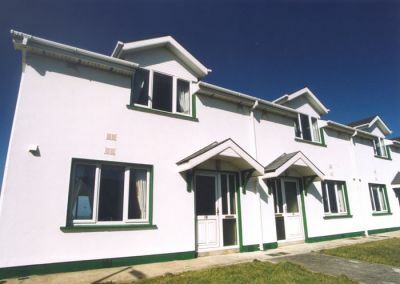 These houses are just 10 minutes walk to the beautiful horse shoe shaped Blue Flag beach which Kilkee is famous for! There are four bedrooms, 1 single bedroom on the ground floor and upstairs there is 1 double room, 1 twin room and 1 single room. Utilities are charged extra as per our terms and conditions. The beach is one of the safest in Ireland for bathing and swimming as it slopes toward the sea without strong current. Another choice for swimmers would be the famous Pollock Holes; which the water changes in every tide. For indoor swimming there is the Waterworld with a range of facilities including bubble pool, shower geysers, lazy river ride and a 61m crystal tower slide. From Shannon: Take N18 to Ennis via Clarecastle, N68 to Lisseycasey, N67 to Kilkee via Kilrush. From Dublin: Take N7 to Limerick. In Limerick take the N18 to Ennis via Clarecastle, N68 to Lisseycasey, N67 to Kilkee via Kilrush. Coming into Kilkee take the first left turn and at roundabout take the 2nd exit off the roundabout that follows the strand line. Take 5th exit which is sign poster ‘Scenic Drive / Loop Drive’. Take the 1st right for Castlefield.